Detached house with 2 bedrooms, 2 bathrooms, living room and large kitchen. La Capanna Di Arsoli is a former barn, independent, about 80 square meters located on a hill on the slope of the Chianti mountains, a few kilometers from Arezzo, Florence and Siena (all three cities of art are within 30 km) At the border between the Chianti and the Valdarno it preserves many historical traces and a great landscape value. Arsoli is a good base for visiting SIENA, FLORENCE, AREZZO AND NOT ONLY. La Capanna di Arsoli is a historic environment where present and past come together in a unique mix to guarantee maximum comfort and relaxation. The location is perfect for those who are looking for peace and tranquility in close contact with nature and far from the noise and noise of the city. La Capanna di Arsoli is on two floors. On the ground floor, equipped kitchen (microwave, electric oven, dishwasher, blender, toaster, electric kettle with infusions and tea (offered by us), espresso machine, cappuccino, hot chocolate (pods offered by us), weighing scale food and everything you need to cook and set the kitchen has a sofa overlooking the Tuscan hills. Very spacious living room with sofa bed with wooden slats, DVD player, with many films in English, Italian, French, Spanish CD player with USB flash drive, flat screen TV, armchair, and on the ground floor there is a walk-in closet with washing machine, detergent for washing, ironing board, iron and vacuum cleaner. shower, sink, wc, hairdryer On the first floor bright double bedroom overlooking the well restored ancient with attached private bathroom with shower, sink, toilet and hairdryer. Terrace / balcony, equipped with lighting, with barbecue area (wood offer) and an enchanting view of the Tuscan hills, equipped with table, chairs, deck chairs and umbrella. In a private garden and surrounded by hedges there is a swimming pool, for the exclusive use of guests, equipped with sunbeds for sunbathing, sofa, armchairs, deckchairs, parasol and shower. You will have a garden for your exclusive use, equipped with table, chairs and deckchairs and also a typical Tuscan loggia, equipped with garden furniture, covered, paved in Tuscan terracotta and surrounded by stone walls, with a magnificent view of the olive groves and hills Tuscan. Illuminated in the evening with lanterns all around the stone wall. the environment becomes very romantic. WI-FI, AIR CONDITIONING, PETS ALLOWED OFFERED. Private, but unguarded, covered parking. Large enclosure for dogs, for those who need it with a wooden xl doghouse. THE FOUR-PAINTED FRIENDS ARE WELCOME AND IF DOCTORS CAN BE WITHOUT LEASH. In about 35/40 minutes by car you arrive in the Val D'Orcia with medieval villages such as SAN GIMIGNANO, MONTEPULCIANO, PIENZA, CASTIGLION D'ORCIA, MONTALCINO, MONTERIGGIONI (very expensive locations both in foreign and Italian cinema, where they have shot many film, to name a few: THE GLADIATOR OF RIDLEY SCOTT, THE ENGLISH PATIENT OF ANTONY MINGHELLA, I BALLO DA BALE OF BERNARDO BERTOLUCCI). In about 30 minutes by car you can reach Castellina in Chianti, Greve in Chianti, Il Castello di Brolio, Castello di Meleto, Vertine, Volpaia. In about an hour and a half you get to Cortona, San Sepolcro or the sea in Marina di Grosseto or Castiglion della Pescaia.COLAZIONE OFFERED TO YOUR ARRIVAL for the first days (milk, fruit juice, espresso coffee, cappuccino, hot chocolate, (waffles offered by us), tea and infusions (offered by us), croissants, biscuits, bread and jams of our production, fresh fruit of the season, if possible of our production.Inoltre you will find a bottle of natural water and other surprises. access to all areas and gardens of the structure without any problem.You can move tables, chairs, deckchairs and sun loungers to sunbathe wherever you please.We are the only guests no one will disturb you.At 800 meters from the hut of Arsoli you get to Montegonzi , a small medieval village full of history and traditions, where you will find an excellent restaurant and two bars.In the village of Montegonzi you can take a walk to discover the history of the village, stello and its ancient churches with signs in English that will explain the history of the old medieval village. A four minute drive from the hut of Arsoli you reach the village of Cavriglia where you will find restaurants, pizzerias, bars, supermarket, gas station, bank, post office, pharmacy, baker, butcher, grocery stores, ice cream shops, carabinieri, hairdresser, beauticians, gym, playground for small children and also the bus station. For those who love active holidays: long walks in the green among olive groves, vineyards and woods (if you want I will be happy to accompany you), running directly from the hut, golf course, gym and flight field 4 km from the hut of Arsoli.A 4 km track for racing bikes, bike and running named "BELLOSGUARDO". 10 km tennis courts, minigolf for children and adults. A 15 km sailing school at the lake of San Cipriano. At 30 km rafting and adventure park for adults and children. At 900 meters riding (also for children with instructor). For those who love the mountain in 35 minutes by car you can reach VALLOMBROSA, CAMALDOLI (the first is an abbey, very old, still inhabited by Benedictine monks, the second is both a hermitage and a monastery. minutes you reach THE CROSS OF PRATOMAGNO and enjoy the view of the entire Valdarno, descending or climbing from the CROSS OF PRATOMAGNO you can stop at LORO CIUFFENNA listed as one of the most beautiful villages in Italy.Many activities also for children, I will be pleased to communicate to you, IN WRITTEN FORM TO YOUR ARRIVAL.The town of Arsoli is immersed in the green Tuscan hills, among olive trees and woods.The typical Tuscan farmhouse, part of the complex of Arsoli, was built in 1809, as can be seen from the stone at the entrance of the farmhouse My simplicity and that of my parents will try to make you feel at home My mother, retired, is delighted with the vegetable garden and will not fail to offer you vegetables and fresh fruit in season, if possible. The estate has 300 olive trees and my father will be pleased to offer you a small bottle of extra virgin olive oil. La Capanna di Arsoli is a 10-minute drive from Montevarchi Train Station. You can arrive by train or by rental car. Pisa Airport 90 minutes. Florence Airport 45 minutes, Bologna 2 hours and a half. Bus station 5 minutes. Covered parking in the property. To get to the hut of Arsoli the road is asphalted, except for 200 meters unpaved, but well maintained and passable with any car. Hospital 10 minutes by car. A 10 minute drive to all kinds of shops, Gucci outlet, Prada and many other brands. FRIENDS FOUR PAWS ARE WELCOME, BUT IF YOU COME IN HOLIDAY WITH TWO DOGS OF BIG SIZE, PLEASE TALK TO ME, BEFORE FIXING. DOGS IF GOOD AND PEACEFUL CAN BE WITHOUT LEASH in full freedom. I am a lover of auteur cinema (Stanley Kubrick, Woody Allen, Bernardo Bertolucci, Vittorio de Sica, Michelangelo Antonioni, Luchino Visconti, Paolo Sorrentino, Alfred hitchcock, Martin Scorsese, Quentin Tarantino, Ferzan Ozpetek, Gus Van Sant, the Coen brothers, Lars von Trieer, David Fincher, Sean Penn, Sofia Coppola Terrence Malik etc. I love animals, reading, dancing, playing sports, trekking, traveling. I volunteer at ENPA (national animal protection agency) and at ANDOS (women with breast cancer). I like good food and good wine especially in company. But I also love craft beer. I love making jams and desserts. I do not like cooking, ironing. I hate those who raise their voices for any reason. I like seventies music (Rolling Stones, The Doors, Queen, The Cure, Bob Dylan, Eagles, Marvin Gay, Led Zeppelin, Bruce Springsteen, David Bowie, The Police). MY MOTTO is: CARPE DIEM. Graduated from the classical high school. From 4 to 20 years I did artistic gymnastics at national and international level. After 25 years as an accounting and pay manager in an office, I decided to make a change in my life. I renovated the former typical Tuscan barn of Arsoli, together with my family, and I started a new adventure. Arsoli allows me to be in close contact with nature, far from the confusion of the city, but in 4/10 minutes by car I have all the amenities at your fingertips. I love this job because it allows me to meet people from all over Europe and beyond. I am happy to be able to share with my guests / extended family, a piece of my life and their life, with the hope that they will have a good memory of me, my family, their stay and our proverbial hospitality and genuineness. I'm satisfied and sometimes they make me cry, when the guests felt at ease, like they were in the family, telling us a little about our lives and our hobbies. 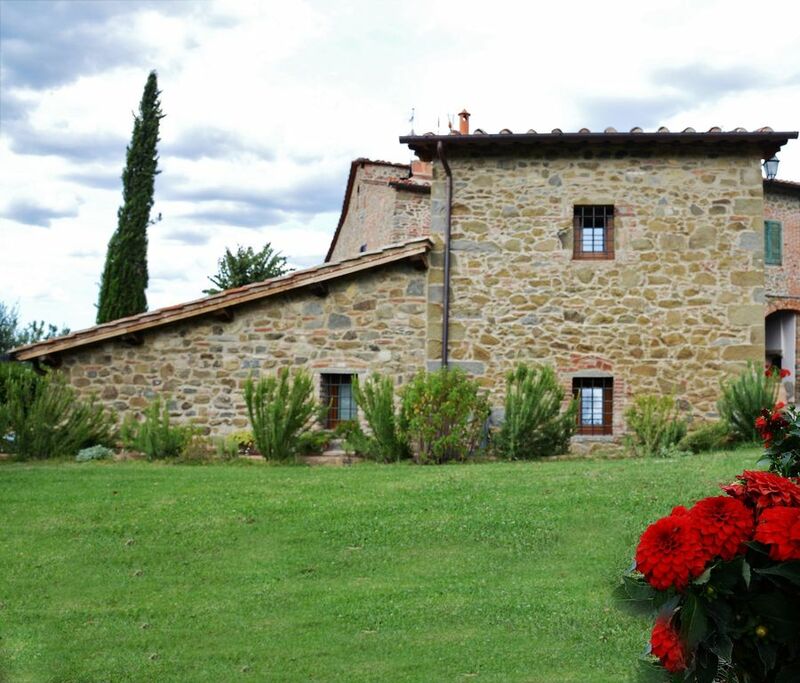 Knowing that you have relaxed and enjoyed Arsoli and Tuscany with its unforgettable places. I feel lucky to be able to give a little bit of magic, in just a few days. I love Arsoli and its history, it belonged to my great-grandparents and being able to share my small and modest paradise makes me feel special. I would not talk about work or rent (of course if the guests are not spoiled) but of a unique experience that made me feel satisfied and reborn, without having to stay closed within four walls for a lifetime. I consider myself very lucky and I think I transmit my joy also to my guests. I fell in love with Arsoli and the medieval village of Montegonzi around the age of 35. (although you have spent all my childhood, in the summer, with my grandparents and my friends and have many beautiful memories). Being away from the confusion of the city and living in harmony with nature is priceless. Feel the singing of the birds just awake and the screeching of the cicadas in the summer. See deer, hares, foxes, hawks in the early morning, in summer, when I walk with my faithful four-legged friend named Carlotta among the olive trees, vineyards and woods. Of course, I'm not a hermit, I like social life. Arsoli is a magical place, not by chance there were Roman temples dedicated to the God of the Sun. On the oven, where bread was once cooked, read the date 1809 stamped on the stone, makes me understand the experience of this place. Not by chance, even in its simplicity, the farmhouse of Arsoli and its Capanna are part of the historical buildings of the province of Arezzo. But do not expect a resort, here we are in the countryside, but do not worry you will have all the comforts. BOTH BATHROOMS HAVE THE WINDOW. COMPLETE WITH SHOWER, WASHBASIN, WC, HAIR DRYER, SHOWER CARPET, SOAP FOR HANDS, TOILET PAPER AND MIRROR. CENTRAL HEATING IN ALL THE HOUSE WITH GAS OR HOT AIR WITH SPLITTER. SUMMER PAYMENT 5 EURO PER DAY. WASHING MACHINE . IRON AND AXIS OF IRON, VACUUM CLEANER. CLOTHING MACHINE WITH ALL FREE CLIPPING. ALSO FOR FREE DETREGENT AND SOFTENER FOR WASHING MACHINE. KITCHEN SUPPLIED WITH DISHES AND CUTLERY, COFFEE CUPS, THE 'OR MILK. GLASSES FOR WATER, WINE GLASSES, KITCHEN KNIVES, PANS, POTS, TRAYS, SALADS, TRAYS, OVEN. CAN PLAY IN THE GARDENS AT PALLA OR TENNIS. ENJOY IN THE POOL. MANY CHILDREN, WHO HAVE STAYED AT THE HUT, LOVE TO PLAY WITH CARLOTTA, MY VERY DOCILE BEAUTY. NOBODY. FOR CHILDREN CLASSIC CARTOONS OR OUT OF RUNNING OR PLAYING IN PRATI A A PALLONE OR TENNIS OR TO HAVE FUN IN THE POOL WITH MATTRESS. THERE ARE THREE GARDENS. TWO OF THEM FOR EXCLUSIVE USE OF GUESTS EQUIPPED WITH OUTDOOR FURNITURE. A GARDEN IN COMMON WITH TABLE AND CHAIRS. AVAILABLE ON PAYMENT 8 EURO PER DAY. FOUR TWO BICYCLES FROM ADULTS AND TWO FROM CHILDREN FROM SIX TO FIFTEEN YEARS. WE DO NOT HAVE A PATIO, BUT A WIDE TERRACE WITH OUTDOOR FURNITURE: CHAIRS WITH CUSHIONS, TABLE, UMBRELLA, deckchair . ALSO (SEE PHOTOS) GREAT LOGISTED TYPICAL TOSCANO, TABLE, CHAIRS, deckchair. THE PRIVATE CHEF, THE HAIRDRESSER, THE SERVICE PERSONNEL, THE MASSAGE CAN BE MADE ALL AT THE HARBORS OF ARSOLI ON RESERVATION AND PAYMENT. RIDING AT 800 METERS. PAYMENT. BOTH FOR ADULTS, BUT ALSO AND ABOVE ALL FOR YOUR CHILDREN, WITH A BRAVISSIMA TEACHER THAT WELCOMES THE ENGLISH. YOU WILL ALSO VISIT THE HORSES OF THE HORSES AND ACCAREZZARLI. IMMERSED IN A SPLENDID PINETA. YOU CAN ALSO ADMIRE THE COWS CHIANINE FROM THEIR FENCING WITH THEIR SMALLS. VERY SUITABLE FOR CHILDREN. Silvia and her family were fantastic! Silvia and her family were great. The property was clean, very well furnished and I would definitely go back. If you are thinking of staying in this area, then this one is a YES! Silvia, the owner, and her family are the kindest and friendliest hosts you will ever meet. The accommodation is a beautifully renovated barn, done to the very highest standards. The location is off the beaten track and offers a quiet and tranquil environment in which to spend a relaxing holiday. The views are lovely and there are plenty of restaurants within a short drive where you can enjoy the local Italian cuisine. If you want a true taste of Tuscan hospitality then this is the place to stay. Paul e Denise sono due persone con gli occhi che sorridono. E gli occhi sono lo specchio dell' anima. Bella coppia che ti trasmetteva allegria e semplicità . Paul e Denise sono persone gentili , educati , con il sorriso sempre sulle labbra e rispettosi . Paul era molto paziente con il mio inglese. Paul è un bravissimo pittore e Denise crea con le sue mani degli abiti davvero carini. Alla loro partenza mi sono commossa. Spero di rincontrali in un prossimo futuro. Consiglio vivamente questi ospiti . The villa was fantastic and the hosts were lovely. Silvia, Anna & Franco looked after us like we were part of the family and in particular our son. The house itself had everything you could think of and was a perfect base for exploring the surrounding area of Tuscany. The villa was exceptionally clean and well maintained. The facilities were even better than described in the advert. We had an amazing two weeks in Italy and absolutely would come back to this area and stay at the villa again if we get the chance in the future. The local restaurant, Osteria di Montegonzi, served lovely food and the views from the terrace are exceptional. They really looked after us and the food was so tasty. We really enjoyed trips to Siena and the villages in the Chianti region. We also visited Florence via the train and even managed a trip to the Lamborghini Museum in Sant'Agata Bolognese. Thank you again Silvia, Anna & Franco and also for all the little treats; the fig chutney was amazing! THANKS ANDREW, YOU HAVE BEEN A SPECIAL REALLY FAMILY. OLIVER ORMAI IS THE OFFICIALMENT OF THE GRANDMOTHER OF MIA MADRE. I'M HAPPY THAT YOU WERE OK WITH US, A SEMOLIC FAMILY, AND YOU ARE FEELING LIKE AT HOME. WE EXPECT YOU IN A NEAR FUTURE. BACI AD HELLEN AND OLIVER. AN EMBRACE TO THE WHOLE FAMILY. the map does not show the exact position of the HUT OF ARSOLI. THE EXACT POSITION IS ONLY ON GOOGLE MAPS: LOOKING FOR: THE HUT OF ARSOLI. AT THE CENTER OF FLORENCE - SIENA AND AREZZO. STRATEGIC PLACE TO VISIT MANY FAMOUS LOCATIONS AND CITIES IN THE WORLD. IN TWENTY MINUTES OF MACHINE UP TO A MAXIMUM OF TWO HOURS YOU CAN VISIT MANY ART CITIES (SIENA, FLORENCE, AREZZO, PISA, LUCCA AND VILLAGES IN THE SENESE (VAL D'ORCIA) AS PIENZA, SAN GIMIGNANO, CASTIGLION D 'ORCIA, MONTALCINO, MONTEPULCIANO, CASTELLINA IN CHIANTI, RADDA IN CHIANTI, CASTLE OF MELETO OR BROLIO, THE THERMAL BATHS OF RAPOLANO OR PETRIOLO, VERTINE, VOLPAIA ALSO YOU CAN VISIT CORTONA, GREVE IN CHIANTI ETC MONTEGONZI THE FIRST COUNTRY 800 METERS FROM THE CAPANNA DI ARSOLI HAS A LONG HISTORY: A visit to the border between Chianti and Valdarno, between streams - or borri as the minor watercourses are called - of Moncioni and Camenata, the village of Montegonzi preserves numerous historical traces and a great landscape value Although the first mention of the fortress of Montegonzi dates back to the eleventh century, the area was already inhabited in earlier times. to the presence of a scholarship, from the Latin "Ara Solis", or Ara del Sole, place where they pay rituals dedicated to the Sun God.Around the fortress there are places whose toponym is of obvious Latin origin, as Fontebussi (sourcesbus), Arsoli (ara solis). In fact, the Via Cassia Adrianea crossed these places, so we can deduce that the area was already inhabited in Roman times. The village still retains its medieval structure, with its ancient and narrow alleys, which descend along the side of the hill at the top of which stands the fortress that, one hundred years ago, was transformed into a villa and farm permanently inhabited by the family Viligiardi. Carlotta, descendant of the Ricasoli family. "The Mercatale" just outside the walls of the castle. Here is the road to the ancient Chiantigiana road, joining the Etruscan road, with the Cassia Adrianea, continuing to the bottom of the Romea. In the "Mercatale" there was a hospice for travelers, managed by the Bigallo of Florence. Starting from 1550, Montegonzi became the seat of the Lega d'Avane and in 1809 hosted the first sessions of the Municipal Council of Cavriglia. LA CAPANNA DI ARSOLI then rises on a historical Romanesque area called "ara solis" and the typical farmhouse was built in Arsoli by my ancestors in 1809 when the LEGA D'AVANE was born. THE CAPANNA OF ARSOLI AND ITS ATTONCENT COLONICA HOUSE ARE BUILT IN A HISTORICAL PLACE WHERE PASSED AND PRESENT IS FOUND IN A UNIQUE MIX TO GUARANTEE THE MAXIMUM COMFORT. OUR RESIDENCE IS PERFECT FOR ALL THOSE WHO ARE IN SEARCH OF PEACE AND TRANQUILITY IN STRICT CONTACT WITH NATURE AWAY FROM THE FRATERNON AND FROM THE NOISES OF THE CITY. IN 5 MINUTES OF MACHINE YOU REACH THE COUNTRY OF CAVRIGLIA WHERE YOU WILL FIND: BARS, RESTAURANTS, PIZZERIAS, SUPERMARKET, BANK, MAIL, BAKERY, FOOD STORE, PARKS GAMES FOR SMALL CHILDREN, LAUNDRY IN TOKS, CLOTHING STORES, HAIRDRESSERS, AESTHETICS, ARTISAN GELATERIES, BUTCHER, GASOLINE. IN 10 MINUTES YOU ARRIVE TO THE STATION OF MONTEVARCHI AND TO THE HOSPITAL OF THE GRIDDING MONTEVARCHI GREAT SUPERMARKETS AND MARKET COVERED OPENED EVERY DAY WITH TUSCAN PITICAL PRODUCTS (CHEESE, SALAMI, FRUIT, OIL, WINE, HONEY, MARMALADE) DIRECTLY FROM THE MANUFACTURER TO THE CONSUMER. PERETOLA AIRPLANE PORTO FIRENZE 41 KM DISTANCE. PLANE PORTO DI PISA 90 KM DISTANCE.